It's a grey, quiet Saturday here. Everyone's off doing stuff: it's just me and the dogs. On Thursday, Sharon and Bill Stiteler came over and we checked the hives and started to feed them. We have six hives right now - two Italians (doing brilliantly in comparison with everyone else after a late start and a lousy year - we even had a super full of honey), two Carniolans (doing okay) and two Russian hives (one may or may not survive even a mild winter, one has a solid chance). We came back to the house. Sharon Stiteler started making noises. Normally when Sharon makes noises, it means that something exciting has been spotted, and it's generally to do with birds. A merlin had taken a red-bellied woodpecker from one of my birdfeeders, and was eating it in front of the house. Yesterday I decided to get some beeswax from the buckets of slumgullion in the garage. It took three tries to figure out how to do it correctly, but I now have a pie-dish filled with clean, perfect, butter-yellow beeswax, smelling faintly of honey, and know how to get it right for next time. No idea what to do with the wax, mind. But at least it won't get thrown out. Today I'm proofreading. 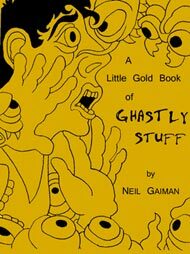 The Little Gold Book Of Ghastly Stuff for Borderlands Press comes out very soon, and they emailed me over the pdfs last night. It's a really sweet little collection, almost entirely from the last decade: two poems, four stories (including, for the first time anywhere, the complete version of my first ever published short story, "Featherquest", published in 1984, cut by half on its first appearance and never reprinted. Do not get overly excited: it isn't very good), two oddments, four articles, a couple of speeches, a few book reviews and suchlike. I signed the 500 limitation pages last week. Then Borderlands discovered that too many people had ordered the signed edition and asked me if I would give my permission for them to overrun the print-run and sell some unsigned, un-numbered copies, to make the people who ordered copies they didn't have happy, and I said yes. The unsigned copies have not yet sold out, although they will probably go very soon after I put this up. There's only ever going to be one printing of this, so, if you want a copy, head over to http://www.borderlandspress.com/littlegold.html and order one now. Bizarrely, it costs more to mail it internationally than the book costs (four times as much if you want to internationally Fedex it). I do not enjoy proofreading. And I need to go back to it. The Vanishing Bee Trick from Bill Stiteler on Vimeo. Amanda Palmer talks to USA Today about her Evelyn Evelyn graphic novel, while Cynthia Von Buhler explains and demonstrates her art methods. I saw Tori last week in LA for a wonderful happy-sad evening of red wine and catching up, and she gave me a copy of Night of Hunters, her new CD. It's become my favourite thing of hers in the last decade - I am playing it much too much. It's haunting, and her daughter, my fairy goddaughter Tash sings on several tracks, something that could have gone so very wrong and didn't. Here's a link to a Tori Interview, with a video for one of the songs (in which you will see the house in which I wrote much of Anansi Boys and in which I finished American Gods, and in which you will see Tash). And finally, as anyone who has been on Google has noticed (have you puppetted the Google Doodle? No? Quick. Go and doodle with it) today would have been Jim Henson's Birthday. 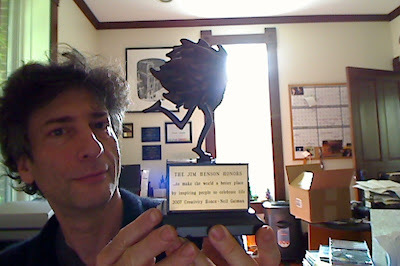 (I've been given a lot of honours in my life, but I am not sure that there is anything I am prouder of than this one. Okay. Proofreading time. Wish me luck.